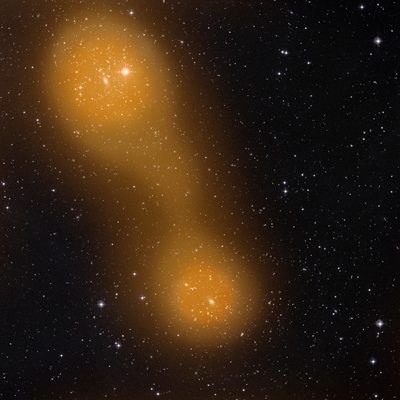 ESA’s Planck space telescope has made the first conclusive detection of a bridge of hot gas connecting a pair of galaxy clusters across 10 million light-years of intergalactic space. Planck’s primary task is to capture the most ancient light of the cosmos, the Cosmic Microwave Background, or CMB. As this faint light traverses the Universe, it encounters different types of structure including galaxies and galaxy clusters – assemblies of hundreds to thousands of galaxies bound together by gravity. If the CMB light interacts with the hot gas permeating these huge cosmic structures, its energy distribution is modified in a characteristic way, a phenomenon known as the Sunyaev–Zel’dovich (SZ) effect, after the scientists who discovered it. This effect has already been used by Planck to detect galaxy clusters themselves, but it also provides a way to detect faint filaments of gas that might connect one cluster to another. In the early Universe, filaments of gaseous matter pervaded the cosmos in a giant web, with clusters eventually forming in the densest nodes. Much of this tenuous, filamentary gas remains undetected, but astronomers expect that it could most likely be found between interacting galaxy clusters, where the filaments are compressed and heated up, making them easier to spot.